The websites we built for this longtime partner are fully loaded with easy-to-use product information. We’ve been privileged to have worked with the marketing team at Benelli USA for the past 16 years. Benelli continues to lead the industry with innovative products. We’re honored to help communicate that innovation to consumers. 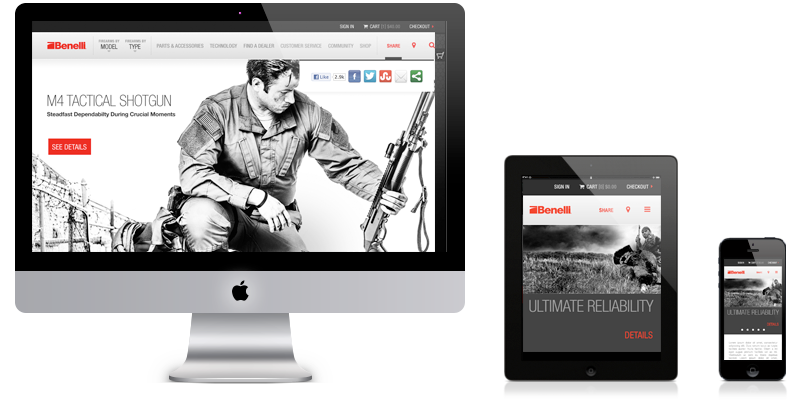 We have put Benelli’s multiple-brand web presence on the forefront of emerging technology. HTML5 and responsive design make the site loaded and ready for visits from any type of device. Benelli has thousands of different firearm variations. With a unique database design, we've given users the ability to find specific models by defining the criteria important to them. That includes gauge/caliber, finish, stock style, or even particular shooting or hunting style. By building on the Drupal 7 framework, we've given Benelli control of its content. That includes the extremely complex firearm pages and specifications charts, that are now easily managed. That means it’s quick and cost effective to make updates. Before we began the site architecture, we defined site goals and key performance indicators (KPIs). Those guided all decisions about content and functionality. Having measurement tools in place ensures we can track the return of this project. 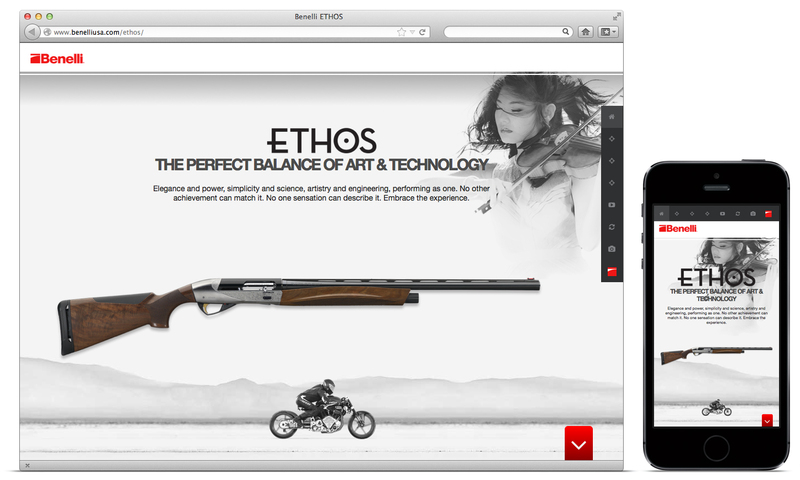 Benelli asked us to develop an interactive promotional site to showcase the launch of its Ethos shotgun. We accepted that challenge and created a responsive, parallax site in just 3 short weeks—in time for product launch. For Benelli USA, the aim was simple: prioritize brand-to-consumer engagement and promote a sense of community on social media. We worked with them to implement a strategy that educates, enriches, and entertains by emphasizing quality content, top-tier customer service, and consistent day-to-day platform management. We accomplished several goals on this project. We made it easy for consumers to find the firearm that’s best for them. We portrayed the identity of the Benelli brands. And we gave Benelli full control of their content. Creating 6 unique responsive websites with ecommerce integration was challenging and rewarding. After launch, the team continues to refine the design and functionality as we strive to exceed the goals set.